The next Sea of Faith meeting in Cambridge will be on 13 May 2015. As always it takes place in the church hall of the Memorial Church, Cambridge and will start promptly at 7.30pm and finish at 9.30pm. At this meeting we'll be exploring the idea of "A Philosophy of Walking". We do not belong to those who have ideas only among books, when stimulated by books. It is our habit to think outdoors — walking, leaping, climbing, dancing, preferably on lonely mountains or near the sea where even the trails become thoughtful. Along with Nietzsche, Henry David Thoreau is, perhaps, on of the most pre-eminent philosophers of walking and those attending the meeting may wish to read his influential essay of 1851 entitled, simply, "Walking". You may find it, and an introductory essay, by clicking this link. 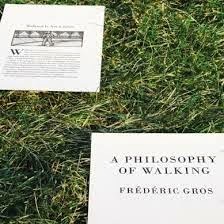 Recently the French author, Frédéric Gros publishes a best-selling little book called "A Philosophy of Walking" which explored a variety of ways into this idea and, should you be minded, this is another excellent introduction to the subject. You can read more about this book by clicking this link. This meeting, following a very brief introduction by the convenor, Andrew Brown, is designed to open up into a conversation in which attenders can bring and share their own stories and experiences of walking and philosophising. We look forward to greeting you in May.